Sunday, May 27th was the closing performance of the New York premiere of ‘Show No Show’ at Tribeca’s The Flea. 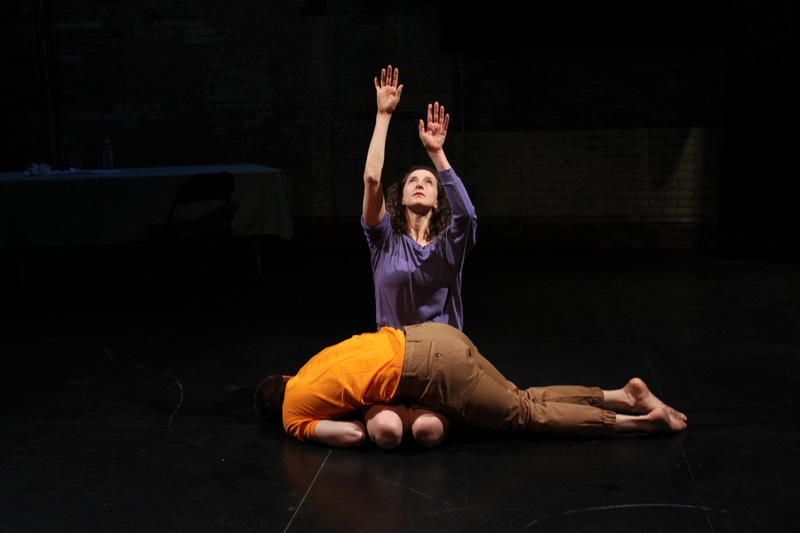 Often funny, occasionally poignant, and always inventive, this duet incorporated different languages, props, sounds, and movement styles to explore concepts of relationship and performance. 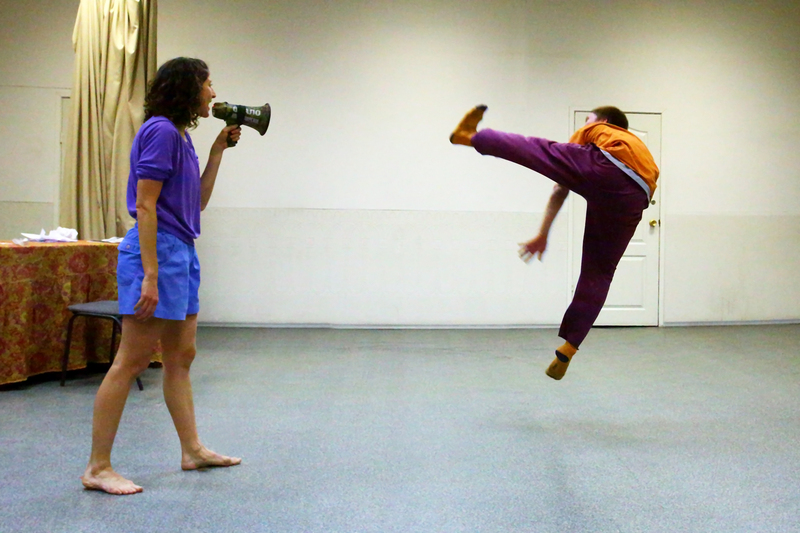 Originally choreographed in 2016, dancer/choreographer Gabrielle Revlock and Russia-based Aleksandr Frolov met during a three-week residency at Omi International Arts Center in August of 2014 where they began developing this work. It is incredible to imagine the piece existing in another space, as use of the windows, curtains, and doors at The Flea seemed specific and essential. In one picturesque moment, Revlock stands on a chair, backlit by a floor-to -ceiling window as Frolov pulls up a blind. Use of the entrances and exits,and features of the room like the long hanging green curtains against a red brick wall, seemed to dictate the movement and the narrative of the piece. It is curious to imagine how the piece changes from one performance space to another, though this may be a particularly New York appreciation of the work; location location location. Who these two characters are, in relationship to each other, is clear in episodes through dance, text, and use of prop. These characters beautifully suited the movement and persona of Revlock and Frolov as fluid individuals in a power play, play being the operative word. In one hilarious section, Revlock was the pet owner calling out to Frolov, loping about on all fours. In another, he was the nervous doctor at her very awkward yet funny check-up. It was very clear when they were having fun together, such as a few rounds of arm wrestling, as opposed to moments of real aggression, such as the intense pas de deux with a window screen held, flipped, and separating them. Use of props such as a megaphone, paper airplanes, a handful of fruit added visual and audio interest to these diverse relationships, intensifying the respective anger, playfulness, or tenderness. In each of these episodes, the two fully explored the use of included prop, the space, and or concept almost to the point that a few felt too long. A few times, these characters with their frantic running or drawn-out sequences of doing little more than slapping each other’s legs, are as annoying to the audience as they either are or for some reason, are not to the other performer. Each interaction takes the viewer to the extreme of every emotion with extended periods of stillness and or silence in contrast to shouting into a megaphone, chasing each other, and throwing themselves or each other against the wall. How each other these small vignettes fit together is not necessarily clear or linear, but the progression through the piece doesn’t ask for explanation. The jump from chuckling at their awkwardness to heartbreak as they go their separate ways is made all the more powerful for the cold plunge from one extreme to the other. In this way, as in life, the piece is spontaneous and unpredictable. 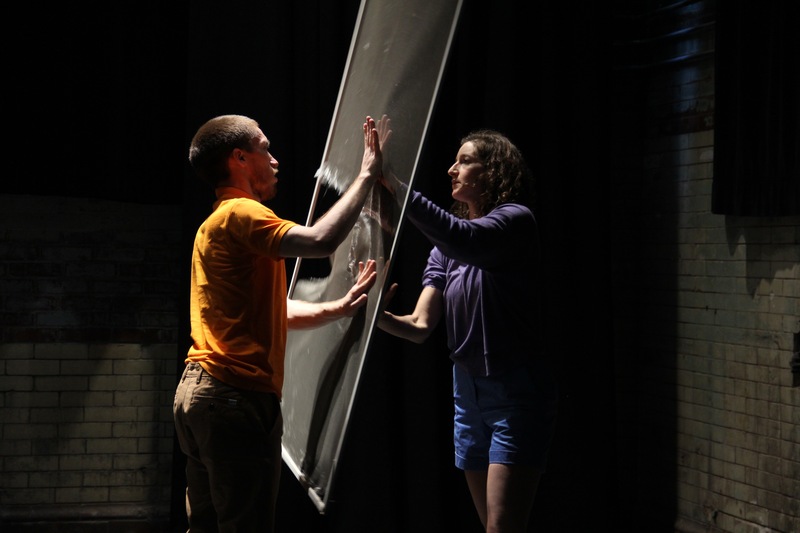 Show No Show is a beautiful and inventive take on performance itself, equally comedic as it is captivating. For more happening at The Flea this season, check out their event listing page.